Check out the re-launched, much improved website of Fotoman Camera. 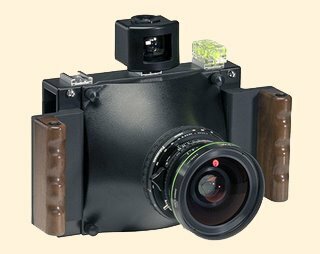 This Hong Kong-based company is known for its well-made, (relatively) inexpensive, interchangeable lens, scale focusing, roll film panorama cameras in 6x12, 6x17 and 6x24 formats. A long-awaited second lineup of large format point-and-shoot cameras has now finally become available, including an ultralight 4x5, an 8x10 and—surprise!—a 4x10 panoramic P&S. Helical focus mounts, viewfinders, a comprehensive selection of regular and panoramic viewfinder masks and a dual-axis bubble level are now offered separately as well for users who would like to mix-and-match with their own equipment. Now this is a kewl camera. All a person needs is an 8x10 enlarger to take these 4x10 negs and they'd be "in like a cheap suit." This looks like a wonderful camera and probably great fun to use. But (and I know I'll likely get flamed here for this opinion) this just seems like a ticket to a train that left the station long ago when the expression "stitching software" entered the photographic lexicon.